Today we’re featuring a Samuel Beckett quote that has gained immense popularity in recent years. You may not have known that this quote comes from Irish author Samuel Beckett, but there’s no doubt you know the words. By itself, you can probably understand why this phrase has become a mantra of sorts, especially in the glamorized world of overworked start-up founders hoping against pretty high odds to make it. Even outside of the business development niche, this quote does sound inspiring. Right? We think so, too. That is…until you read the rest of it. Is the “Fail Better” Quote Really Inspirational? As this markedly darker snippet of text demonstrates, Worstword Ho! seems to have nothing to do with positivity, motivation, or progress. In fact, it seems that the only recompense Beckett’s narrator can come up with for the absurdity of existence is to “fail better” the next time. In Beckett’s bleak worldview, life is already a grand failure (or a tragi-comedy, if you’d prefer) in which we are all, like the narrator of Worstward Ho!, sitting in an inexplicable “dim void.” The fact that this Samuel Beckett quote has been taken so far from its original roots is pretty fascinating. As O’Connell notes, Samuel Beckett was interested in failure, full stop. Not failure as a necessary path toward riches, or fame, or (everyone’s favorite buzzword) “innovation.” Just failure. The “Dim Void:” Beckett’s Worstward Ho! Except for this one “fail better” quote, nearly every other snippet from Westword Ho! reflects the real Samuel Beckett: brooding, morbid, and completely avant-garde. In many ways, this text can be seen as an extended meditation on the inexplicable nature of being and not-being. Beckett’s narrator seems to be trying to work out the paradox of emptiness and presence, of birth and death. Worstword Ho! vs. Westword Ho! The title of Worstward Ho! is a riff on the 19th century novel Westward Ho! by the English novelist Charles Kingsley, offering a very contrasting view of life. …and perhaps back again. It’s not quite clear, but some people see the theory of reincarnation in this work, just as “metempsychosis” is a major theme in Joyce’s Ulysses. This phrase succinctly encapsulates Beckett’s later minimalist aesthetics. You can also see the unreliability of language as “word” almost slips into “worse” in this quote. What Does Worstword Ho! Even Mean? A few literary critics have tried to classify Worstward Ho! as a novella, but it’s quite difficult to make out a clear plot in this text. Readers who support the theory that Worstward Ho! is a novella point out that this text is mainly about an old man, an old woman, and a child visiting a graveyard. It’s left up to us, perhaps, to fill in the blanks surrounding these three figures. As with many of Beckett’s other works, there’s a great deal of disagreement over what Worstward Ho! actually “means.” The woman, man, and child might be symbolic of stages in the human condition. Or they might not. As with any other work of fiction, readers only get out of Beckett’s text as much as they put into it. A Nobel Prize-winning author, Samuel Beckett’s been called many things: Avant-garde. Dark. Intense. Depressive. But inspiring? Not so much. To understand more about this famous Irish author—and see what’s beyond his out-of-context “fail better” quote—let’s take a little deeper look at his life. Samuel Beckett was born in 1906 in Dublin and was raised in a Protestant household. 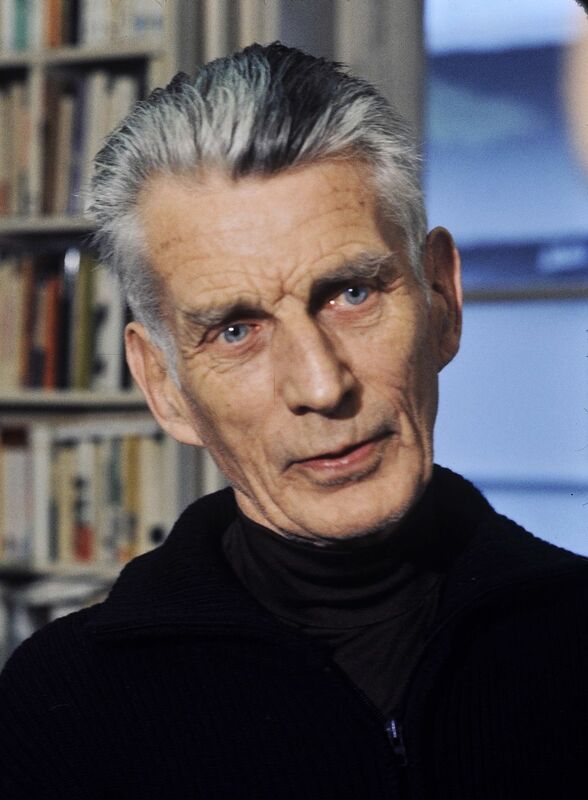 After receiving his BA in Romance languages at Trinity College, Beckett moved to Paris where he became close friends with fellow Irish writer James Joyce. Beckett learned a great deal about writing from Joyce and helped the great author with his last novel Finnegans Wake. When World War II broke out, Beckett remained in France and worked with resistance fighters. For his efforts, Beckett was awarded the Croix de Guerre from the French government in 1945. Before the war, Beckett mainly wrote essays on literary criticism. The only work from this period students read today is Beckett’s analysis of French author Marcel Proust. Most literary historians agree that Beckett’s first great novel was Watt, which was published in 1953. Beckett then published a major trilogy of novels called Molloy, Malone Dies, and The Unnamable. But it wasn’t until he produced his classic absurdist drama Waiting For Godot that Beckett became a celebrity of Avant-Garde theatre. 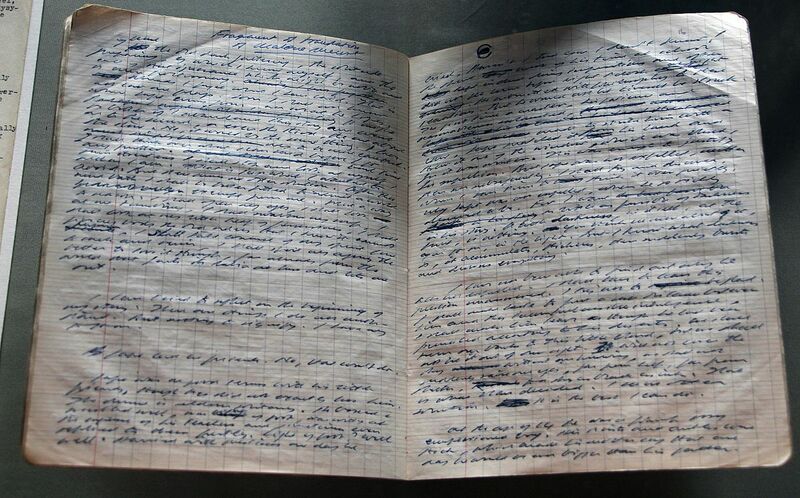 Beckett spent the rest of his life mostly moving between the Marne Valley and Paris. He was a famously reclusive writer who rarely gave interviews, although he was generous with his time for serious artists that sought him out. As he matured, Beckett tried to parse down his prose to the bare essentials. In fact, some of Beckett’s later works (like the 30-second play “Breath”) had no words at all. The Nobel Prize Committee awarded Beckett the Nobel Prize in Literature in 1969. Although he accepted the award, he didn’t make a speech and he generously gave away all of his prize money. Beckett passed away in 1989, just a few months after his wife Suzanne Déchevaux-Dumesni. The two were buried in the French capital’s famous Cimetière de Montparnasse. To honor the great writer, Parisian officials (perhaps ironically) named the Allée Samuel Beckett near the infamous Catacombs in his honor. 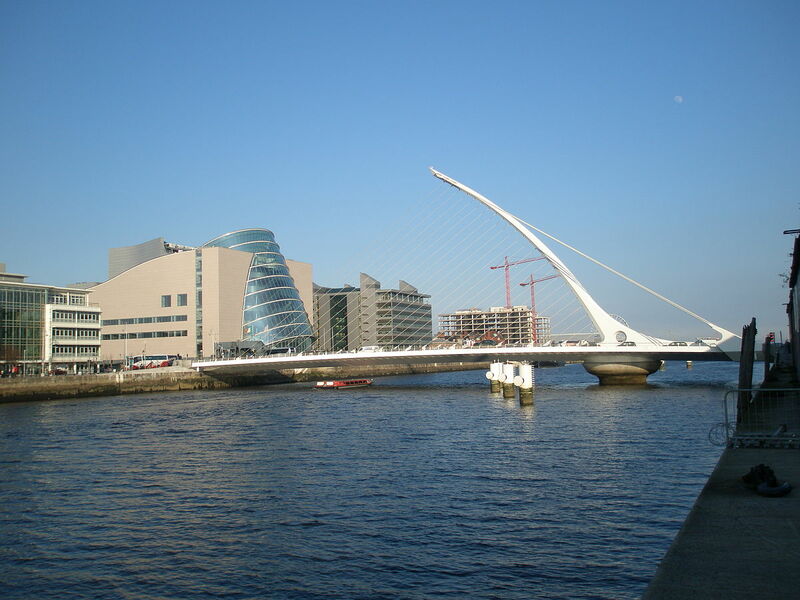 In 2007, Dublin also honored the influential writer with the Samuel Beckett Bridge over the River Liffey. Although Beckett is often seen as a morbid writer, he often injects his own unique sense of Irish humor into many of his plays and novels. Much like Joyce’s work, many of Beckett’s texts are full of references to some of his favorite authors in the Western literary canon, especially Dante Alighieri. Beckett was a great admirer of Dante’s poetry. It’s even possible that Beckett had the final lines of Paradiso in mind when he composed some sections of Worstward Ho! Just like us, Beckett is in an age far removed from the faith of the Middle Ages that inspired the soaring cathedrals all across Europe. Indeed, instead of building the grand cathedrals, we are living amidst their rubble. With these immense suffering of World War II at the forefront of his mind, Beckett suggests that there’s little to be hopeful for in the atomic age. Interestingly, despite all of his pessimism about the human condition, there is still a faint desire in Beckett’s work for union with the divine. Tips for Further Study of Worstward Ho! Beckett’s Worstward Ho! is extremely rhythmic and relies on short staccato sentences. When you listen to thisprose-poem, it almost sounds like an incantation and can have a hypnotic effect. If you do decide to listen to this text from a trained reader, then you will want to hold a copy of the poem in your hand to keep track of Beckett’s wordplay. A few words Beckett switches around in the piece include the pairs “know”/”no” and “two”/”too.” Also, later in the text, Beckett uses the word “prey,” which could be mistaken for “pray” if you’re just listening to the poem. There are many excellent readings of Worstward Ho! online. You can also find Beckett’s original Worstward Ho! text alongside helpful glosses by Colin Greenlaw on this webpage. “Fail Better”: What Does It All Mean? Here at Books on the Wall, we love digging into quotes and all things quote related—from what work the quote came from, what the author meant by it, how modern society has interpreted it, and whether the supposed author even wrote the quote in the first place. When you start looking deeper into the many quotes that float around our collective conscience and the internet (and in this case, on tennis player Stan Wawrinka’s tattooed arm), you’ll see pretty quickly that there’s always more to the story than the little bit of text that happened to become famous. And by now, you’ll realize that this is definitely true of this particular Samuel Beckett quote. And this all raises an interesting question: Does a quote’s context matter? If not for the misplaced fame of this Samuel Beckett quote, tons of people would never have even heard of this groundbreaking Irish author. Plus, it could be argued that—despite its undisputed out-of-contextness—the “fail better” quote has truly inspired people, maybe even changed lives. So does it matter that its author would probably cringe to learn how commercialized and, well, positive it’s become? How much should an author’s original intent color our view of his or her words? In the end, we really don’t know. It’s certainly an interesting question to consider. What do you think? Let us know your thoughts in the comments below. 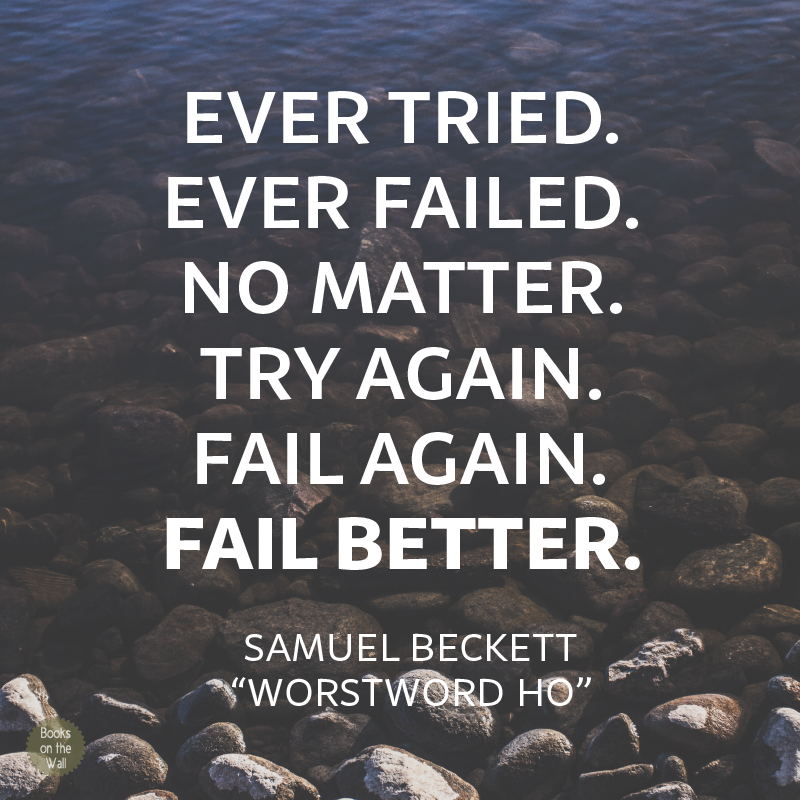 14 Comments on "Samuel Beckett: Fail Better and “Worstword Ho!”"
Really enjoyed the reading and the framing. I completely agree. That was the original inspiration for this post — I saw that the quote was often being used in an inspirational way, but didn’t know the original context. Once I did some digging, I was surprised to find out Beckett’s actual intended message. A great read, it reminds me of Philip Larkin’s most quoted ‘what will survive of us is love’, where the context of hopelessness, fear and loss is taken away to leave a positive romantic message which isn’t really there but makes people happy and ironically, hopeful. That Larkin quote has a beautiful sentiment. Succinct, but very expressive at the same time. Bravo … from top to bottom! Thank you for this wonderful informative post. I have heard the “Fail better” quote for years, and (quite frankly) liked it’s inspirational quality. Then I heard it attributed to Beckett and thought, “no, that can’t be right — it’s too optimistic”, and thus found my way here when I went to check it out. Now I find that I still like the inspiration (and will, guiltily, continue to use the passage to stimulate students and colleagues), but will now also embrace and quote the full dark pessimistic counterpoint of Worstword Ho! I’m glad you enjoyed the article, Steve! I agree in that I still find the original, out-of-context quote quite inspirational, even if I know that that’s not exactly how Beckett intended it. Thanks. I came for the context of the quote, convinced if it was Becket it couldn’t really be positive. While the context you give has confirmed my doubt, I suppose we can’t deny other people the chance to be positive, and how to prevent quotes being taken out of context anyhow? Full scale plagiarism is wrong, but enthusiastic use of a few of other peoples’ words in the same order is pretty harmless. Language belongs to all of us, just attribute the original author. You have reminded me to read more Becket. Glad you enjoyed the article, Shivangi.